Numerous Field Managers, Strategic Communications and Mitigation & Recovery Team providing counties across Colorado. View or download the complete Colorado Daily Status Report for July 31, 2015. The Colorado Division of Homeland Security and Emergency Management and the Federal Emergency Management Agency have established a Joint Field Office to coordinate the recovery from this spring’s flooding and severe weather. The Joint Field Office in Denver will house state and federal personnel involved in the response and recovery from the severe storms, tornadoes, flooding, landslides, and mudslides that occurred between May 4 and June 16, 2015. DHSEM Media and Information Line: 720-432-2433. On July 16, President Obama issued a disaster declaration for Baca, Elbert, El Paso, Fremont, Logan, Morgan, Pueblo, Saguache, Sedgwick, Washington, and Yuma counties, making state, county, and local governments, as well as certain non-profit organizations, eligible to receive reimbursement for repairing infrastructure damage caused by the storms, as well as the cost of responding to them. Additional counties are being evaluated at this time to determine if the state will request federal aid for them as well. View or download the complete Colorado Daily Status Report for July 30, 2015. 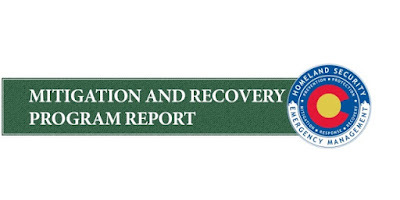 The DHSEM Mitigation and Recovery Report has been posted for July 29, 2015 and is available to view or download at www.bitly.com/MARS07292015. Centennial, Colo. –July 29, 2015 – The Colorado Division of Homeland Security and Emergency Management (DHSEM) begins Public Assistance Applicant Briefings on Thursday, July 30 continuing through Thursday, August 13, 2015. The Applicant Briefings are the first step for impacted jurisdictions in the Public Assistance Grant Program process. The Public Assistance Program provides grants to state, local, and federally recognized tribal governments and certain private non-profit entities to assist them with the response to and recovery from disasters. Specifically, the program provides assistance for debris removal, emergency protective measures, and permanent restoration of infrastructure. The Public Assistance Grant Program is a reimbursement program. The Public Assistance process begins after the disaster declaration. The Colorado DHSEM conducts the Applicant Briefings for state, territorial, local, tribal and Private Non Profit (PNP) officials to inform them of the assistance available and how to apply for it. A Request for Public Assistance must be filed by the grantee within 30 days after the area is designated eligible for assistance. Following the Applicant's Briefing, a Kickoff Meeting is conducted where damages will be discussed, needs assessed, and a plan of action put in place. A combined federal/state/territorial/tribal/local team proceeds with Project Formulation, which is the process of documenting the eligible facility, the eligible work, and the eligible cost for fixing the damages to every public or PNP facility identified by State, territorial, tribal, or local representatives. The team prepares a Project Worksheet (PW) based on actual costs or on the basis of an estimate for each project. The State of Colorado was awarded a major disaster declaration on July 16, 2015 for 11 counties be included in the disaster declaration for Public Assistance based on the joint preliminary damage assessments conducted in Baca, Elbert, El Paso, Fremont, Logan, Morgan, Pueblo, Saguache, Sedgwick, Washington, and Yuma counties. Additional counties may be added if verified damages meet indicators following Preliminary Damage Assessments currently underway in five additional counties. Location/County Numerous counties across Colorado. Resources Regional Field Managers, Strategic Communications and Mitigation & Recovery Team providing on-going support. Presidential Disaster Declaration A Major Disaster Declaration for the Colorado Severe Storms, Tornadoes, Flooding, Landslides, and Mudslides (DR-4229) was declared on July 16, 2015. View or download the complete Colorado Daily Status Report for July 29, 2015.